Moody was the star of class yesterday; he came home with a star on his hand! 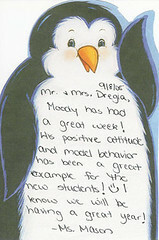 Also, his teacher sent the penguin note with him... what a surprise--Moody a model! He started Hip Hop yesterday and Ms. Angie said he was excellent in class! My, oh my! Another bit of info that's great: Westerville District schools rank in the top 16% nationally and earned a gold medal! It's my day off today... no running around with the kids, Dad will do that, yay! I picked the busiest day and he caught me, but hey, it's all about sharing... thanks honey! I will still be running around though. Going with Nadia and her mom for lunch and to do her baby gift registry. Nadia's mom arrived in the US Sunday; I'm happy for Nadia, but can't help envying her for having her mom here!